Do you want to make an even bigger impact on trails beyond participating in an Alternative Break? Do you have friends and family that want to support your volunteer efforts but don’t know the best way? Do you want to earn some sweet outdoor SWAG to use on future adventures?! We are providing our dedicated college trail stewards the opportunity to make an even bigger impact on trails beyond their week of service by fundraising for trails. We’ve set up a Team fundraising page on behalf of American Hiking Society’s Alternative Break program and invite you to join us by setting up your own individual fundraising page. It’s easy to do and takes just 5-10 minutes. In addition to more “boots-on-the-ground”, raising funds for trails can earn you some really awesome gear to take on your next adventure. 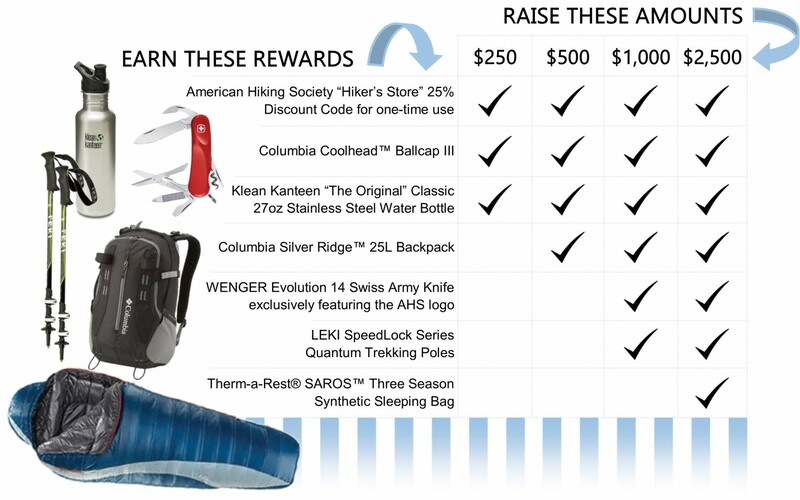 We’ve curated an extensive list of some of the best outdoor gear and equipment in the industry to reward you for your fundraising efforts. 1. Visit the American Hiking Society Team page, HERE. 2. Click on “Join this Team” on the right sidebar to become an American Hiking Society team member. 3. Set up your individual fundraising page. Make sure to customize it to tell your story. Brag a little! You are spending your spring break giving back to trails on your upcoming Alternative Break- you should be proud! Tell your story about why you volunteer and what others’ support means to you. Others might not understand why you volunteer and this is your opportunity to tell them- and get a little trail love in return! 4. Spread the word. Start promoting your individual fundraising page by sending emails, posting updates, and sharing on social media. We know that many of your supporters would be happy to support you as you Get Out and Give Back! Reach out to friends, classmates, and family that could support your stewardship efforts. *This fundraising opportunity will end on May 7, 2017. Volunteers can raise funds and accept donations until 4/1/2016, even after completion of their Alternative Break. All prizes will be sent in May 2017.